It's a sequel to Bridges.At first I thought 'Stupid boys, why don't you talk to each other???' But that would have ruined the surprise. ;)A sweet and short Valentine's Day story. 2.5 starsWhile I like Bridges (which is a free short story) very much, the sequel doesn't really live up to its predecessor. I am having issue with it, similar to what Arthur Bedwyr mentions on his review. One, the "secret" that Dallas keeps from Brooklyn is NOT a simple thing. ((view spoiler)[Dallas ends up renting an apartment for both him and Brooklyn, without even discussing it with Brooklyn first!) (hide spoiler)]. I don't care if Dallas wants to do that as a surprise, to make Brooklyn happy, but he does that without thinking about Brooklyn's feeling -- Brooklyn worries whether Dallas is cheating on him or whether Dallas wants to break up -- and I SERIOUSLY think it is one important event that should be discussed with your lover. Personally, if my own boyfriend does that to me without discussing it first, I will be totally furious with him. I totally think that Dallas has been pretty selfish here.Two , this is just my feeling based on my memory of the first story, which COULD be wrong because I know I cannot rely on my own memory :p ... but it feels like Dallas and Brooklyn somehow change personality. The first story is from Dallas's point of view, and this one is from Brooklyn's. However, I never feel of Brooklyn to be having lack of confidence like in this story *shrugs*The writing is still good of course, but not my favorite of hers. 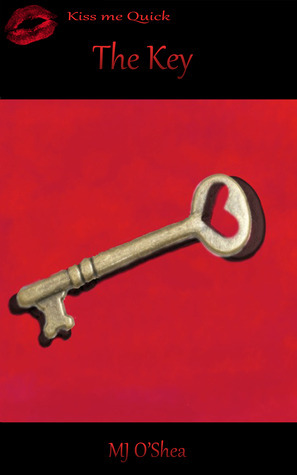 Reviewed for heartsonfirereviews.comThe Key is part of the Kiss Me Quick Valentine story collection by Less Than Three Press. This short story is a continuation of the relationship of Dallas and Brooklyn (still love the names) from the story Bridges. They are in college, away from Sugar Creek, and together. Dallas, however, has been distant, absent and is basically caught lying. The story is told from Brooklyn’s POV, and I felt so bad for him during this time. To be honest, Dallas was really ticking me off. While his end result was a loving thing, and he wanted it to be a surprise, the way he went about it was all kinds of awful. Brooklyn is really thinking that this man he loves, who he gave up his family for, who he came out for, is cheating and going to leave him. He finds packed boxes in the closet, and posters gone from the room! When Brooklyn wakes up on Valentine’s Day to no Dallas, just a note reading: “B-	I’m not going to be home tonight so don’t wait up. I’ll see you tomorrow. -D” I just wanted to kill him. He lost big points right then, because no matter the outcome, he put Brooklyn through hell for no reason. He did NOT need to push him away as he did “can’t we just sleep”, etc. All that being said, I really like these two (stupid man move aside), and was happy they were out of Sugar Creek and were somewhere they could be together and be happy. Phew. This went well for Brooklyn! As always, lovely writing style ~! Thank you. This is a short story about the characters from Bridges, Brooklyn and Dallas. They are now out and together at college, but things don't seem to be going very well. They don't have time to be with each other and the pressures of classes and jobs seem to be constantly in the way. As Valentine's day approaches, things seem to be going from bad to worse. Dallas is working extra shift, lying about being at the library, rejected Brooklyn when they are finally together. Then Brooklyn gets a note the night before Valentine's day from Dallas that he won't be home that night - this after Brook finds half of his boyfriend's stuff packed up in boxes and posters removed from the walls. Of course he is sick with worry - literally! I felt so bad for Brook at this point and boy was I mad at Dallas. If things were really over, I would have expected Dallas to be straight up about it. (view spoiler)[ While Dallas was planning his surprise, he should have said at least something to Brooklyn. I'm chalking it up to him being in his first relationship and not realizing that what he was doing would look so suspicious when his intentions were totally honorable and loving. And Dallas is really lucky that Brooklyn didn't pop him one for putting him through it! (hide spoiler)]The nice little twist at the end almost makes up for the grief and angst through the story. Is there going to be more??? This story short centers around Valentine's Day and is a sequel to Bridges. It picks up a few months after the end of Bridges with the guys in their first college year.Brooklyn is becoming concerned about how his relationship with Dallas is showing signs of trouble. Dallas spends all his time either working or studying and seems to want to spend little time with Brooke. Then Brooklyn starts to get stronger hints that all is not as it should be and he starts to despair and wonder how he can fix things. He figures Valentine's Day is looming and its his nearly last chance to convince Dallas to stay with him.The story is short and I really enjoyed revisiting these characters from Bridges which I really enjoyed. My heart just went out to Brooklyn as he experienced all that worry over things while Dallas appeared oblivious. Things really didn't look good, but I had hope for this couple. Thank goodness my hopes were not in vain.This is one of those sequels that really has to be read in order, but I recommend the series for those who enjoy the Coming of Age Discover Who You Are type contemporary romances. I really loved Bridges and was very excited for this follow up of the relationship between Brooklyn and Dallas. I was a little annoyed by how secretive Dallas was throughout most of the book. (view spoiler)[I had a hard time running with the fact that he would run out and rent an apartment without even discussing it in the first place(hide spoiler)]but by the end of it, I was even more in love with how in love these guys were. Dallas would do anything for Brook and you could tell, even in this short story. Was frustrated and not liking the story as I read it but by the end, after I got over my own angst and thought it through more, I found that I really LOVED IT! Wow... that one got me, I should have read the reviews and stuff first, I totally thought Dallas was cheating and what a jerky way to do it too lol I was wrong but still, a little communication would have went a long way, I hate that Brooklyn had to think such crap things for so long and doubt his relationship. It was sad for him.Cute ending though, even if Dallas went about it the wrong way, his surprise was still cute and I'm glad it wasn't like we thought it was. Also, kinda bummed only 17 pages when it was $1.49... I mean, I'll pay for a good book, I don't mind that... but for only 17 pages? That sucked. For a short story, this had a good amount of angst. I was really engaged from the beginning. Of course, I absolutely loved Dallas and Brooklyn in Bridges so I might have loved this short even if they watched paint dry. It was great reading about them even though it was a bit of a nail-biter. Six months after their first kiss Dallas and Brooklyn are busy at college. What is Dallas hiding so that Brooklyn don't get to see him a lot even though they share the same dorm room?Nice little sequel to the original story. And oh so romantic!My review to. A short look at their lives after Dallas and Brooklyn have been in college for a while. Life and school are both hectic and Brook fears losing the connection he has to Dallas, and maybe even Dallas himself. How do you cling without being clingy? Brooklyn doesn't have an answer to that question, and he's stressing out with how much time Dallas is spending in the library and texting other people.A nice little interlude, but short. I loved teh first part and the short continuation might be an often used trope but it is used wonderfuly and the story just comes alive on teh pages. It was hearbreaking as Brook's insecurity culminated and while it was pretty clear what Dallas was actually doing - the title IS a big give away, there was a little bit of uncertainity still. This is a very sweet short story about a couple hitting a bit of a roadblock in tehir relationship and coming out stronger at the other end. It was an absolute pleasure to see those two again and to see what happens after the HEA from the first book was beyond sweet. M.J., I could feel the Brooklyn's insecurities along with him and for a sec I was scared too. The things you make me feel when I read your books, well they resemble the butterflies in the tummy syndrome, I love it.Keep writing beautiful things! A kind of a bonus to Bridges, this time from Brooklyn's POV. Sweet and sigh-worthy, though I sorta wanted to smack Dallas up his head for giving Brook such a fright. Definitely checking out this author's other books! I liked that they were both happy in the end, but I felt like Dallas' actions were callous and hurtful. If I were Brooklyn, once I was done being relieved that I wasn't being cheated on, I would be mad as hell for the distant attitude, the lies (even if they were to keep a secret), and the lack of discussion about a big decision. I loved this perfect little follow up to the short story by M.J. O'Shea featured in the free M/M anthologies that can be found listed in the M/M Romance group. Brooklyn and Dallas were two of my favorite characters to emerge from the anthologies and I was so tickled to fing this sequel. What a treat. It's a sweet short story that takes place 6 months after Bridges, but instead of reading from Dallas POV, readers get to read from Brooklyn's POV. I thought it was a good read. We didn't get to see a lot of emotional play from Brooklyn in Bridges so this was a nice change. Broke my heart at first, because of innocence and insecurity, but Dallas and Brooklyn did not disappoint in the end. I short story of miscommunication, innocent misunderstanding, good intentions and finally a HEA. I do love these characters and would not mind seeing more of them. This was a blip of a story. Not sure if this story even needed to be written. Bridges was pure perfection. The Key, not so much. You can read this in 5 minutes top. Not much to it. I sorta wish I'd never read this actually. I don't see the point. When, I ask you? When will guys learn to communicate? Of course, Dallas did mean well, but this so could've blown up in his face... and the stress and worry that Brook went through? Seriously? Guys!!! *shakes head* LOL!!! Im so happy that we got a follow up story for Dallas and Brooklyn. I really hope we continue to get more of them.